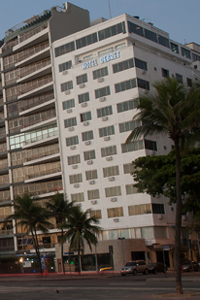 Located close to Copacabana Beach and considered one of the more traditional hotels of Rio de Janeiro, the Golden Tulip Regente is committed to insuring the comfort of the guests and the quality of their stay. The hotle has 240 rooms and two suites all featuring air conditioning, cable TVs with international channels, telephones, sound systems, mini-bars, and hairdryers. The hotel also has available for the guests use conference rooms, 24 hour room service, a swimming pool, snack bar, lobby bar, and easy access to internationally distinguished restaurants. The hotel offer special facilities for handicap passengers. When would you like to stay at Golden Tulip Regente Hotel ? 1) Rates at the Golden Tulip Regente Hotel may not be valid during Carnival, New Years, Easter and other special dates.